An incredible diversity of ‘weeds’ covers the disturbed sand. Here is a journal entry from 2012. Today is Friday the 13th of April 2012. One of the most significant changes over the last few months has been my natural leaning towards ‘raw foods and wild edibles’. In retrospect it is something that has been coming for some time and for a multitude of reasons. It seems that now it is appropriate to give it a go. It is early days yet, but I feel like it is the most natural thing. How it has affected things is interesting and I do hope to record them as I notice them because otherwise they will pass quickly and become second nature and I won’t properly recall the transition that was made. As I was watering the garden this afternoon I noticed to my delight all the weeds popping up with the autumn showers and the ample sun we have been having. I say with delight because I have been using many of them for green smoothies and in salads. 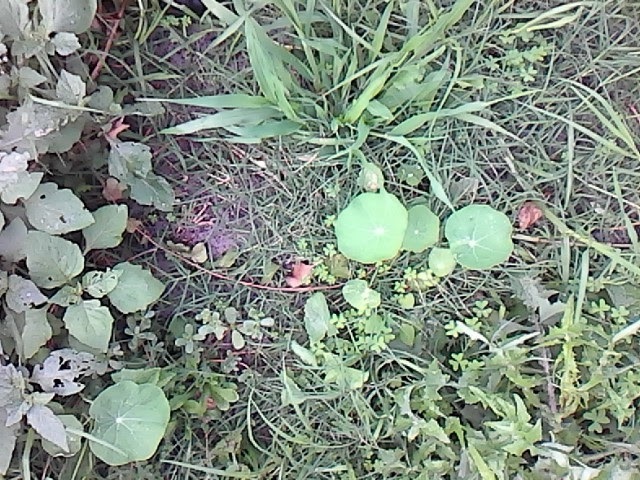 Nasturtiums have been coming out everywhere after I left them to roam over summer and drop their seeds. Many of the new seedlings have been attractive to the cabbage moths and have the green caterpillars on them which I usually lift from the garden whole and throw in to the chook pen. The fresh, new autumn nasturtium leaves I have also been using in salads. I don’t use any chemical sprays in the garden so I know that the weeds and plants that come up are fair game. Now it is a race between me and the guinea pigs as to who gets to them first. I’ve had my eyes on a lovely little dandelion seedling forming under the choko and noticed instantly the other morning that something had eaten half of the leaves off it. The little pigs had beaten me to it. It seems absurd in our society to be gleefully watching a weed evolve so you can eat it, let alone being in competition with a couple of free range guinea pigs over it. With that said, can you even consider the paradigm shift that would have to occur for your average person to make that leap? This new dietary shift will have it’s implications on the garden for sure. For a start weeds will be allowed and encouraged to grow where they appear. If the situation is good they may be encouraged by picking leaves only, otherwise the whole plant will come out. It makes for an interesting retrospection for me. My current practice has been to sieve garden soil from the chook pen to replenish the containers used to grow salad greens. I usually sow my vegetable seeds straight in and before they come up there is a diverse range of ‘weed’ seedlings growing. These get thinned out and either used for our salad with dinner or given to any number of animals for feed from guinea pigs to quail to rabbits or fish. We have been harvesting abundant quantities of purslane from the other block. Following the initial earthworks, thistles and purslane popped up all over the sand which we harvested in late summer and chopped up for salads.